Although “Shogun Assassin” was on my movie wish list Google Doc for several months, I never officially ordered it, nor did any of my loved ones or dear friends that have access to the list. So I am at an utter loss as to how it arrived at my doorstep a month ago. It must be shogun witchcraft! Anyway, I realized after watching it that the movie is actually a compilation of two 1972 Kenji Misumi films: “Lone Wolf and Cub: Sword of Vengeance” and “Lone Wolf and Cub: Baby Cart at the River Styx.” Both of these original Japanese films are available on Netflix, but the 1980 American/dubbed-into-English release, directed by Robert Houston, is not, so it’s worthy of a brief mention here. 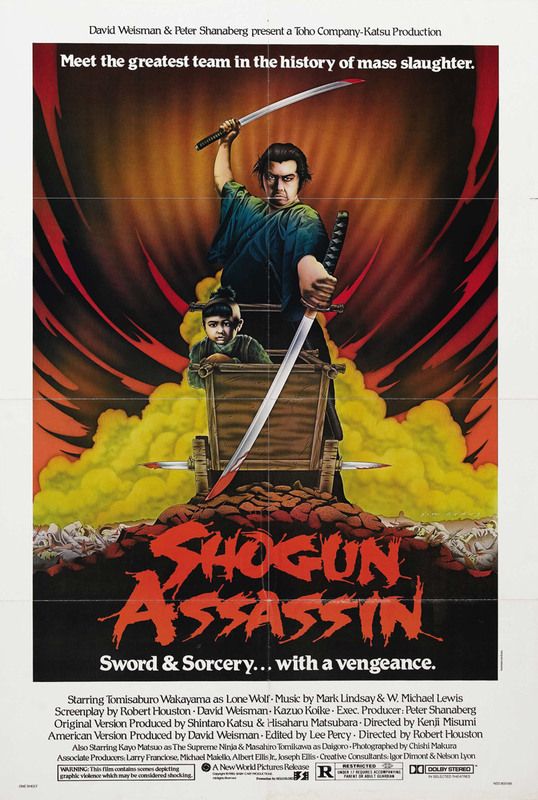 Disclaimer: I am NOT a samurai enthusiast, was bored stiff by both “Kill Bills” and even most of the purposefully shlocky samurai films I’ve seen (most recently “Enter the Ninja.”) But I was thoroughly entertained by “Shogun Assassin,” and not just for its camp value. The film is narrated by a throaty-voiced young child who sounds like Ricky Schroder on “Silver Spoons” reading from a cue card. But his pontifications (mostly of the “My dad was a hero” and the “My dad was the fiercest shogun” variety) only occasionally break up the action. And there sure is a lot of action here: heads split open; arms, toes, fingers lopped off; blood and viscera splattering from severed limbs and organs. Tomisaburo Wakayama, the actor playing the hero Lone Wolf, seems a bit fat and enervated to be convincing as this indefatigable one-man army; he’s given very little emotional range, either wearily violent or wearily weary. But you’ll get a kick out of watching him push his mohawk-sporting baby around in a cart, teaching the baby the art of self-defense as geishas, other fat dudes and sombrero-wearing ninjas spring out of the forests, deserts and other barren landscapes they traverse. In one scene, knives project from the cart and slash the geishas to pieces; in my personal favorite, the hero smacks a shredder into the sand and blood seeps through the sand; a warrior that had been buried under the sand emerges and beckons his army forth. The mewling synth music is aptly ominous, as are the jump cuts to fierce facial close-ups.